There are 34 reviews of Iris Nobile. I expected more iris. Unfortunately I get too much citrus from this one. It's not a bad fragrance. It just lacks the floral I wanted. I only get mild iris, orange blossom, and ylang ylang. Not much of a base here either. Feminine, pretty, and perfect for a work environment. This surely wouldn't offend anyone. Gossamer light and diaphanous, Iris Nobile catches the mood of a shaded spot in a summer garden. The note placing is faultless, as can be expected from the two perfumers involved in its creation. Delicate, cooling citruses introduce a breezy white floral theme (mainly orange blossom and tuberose to my nose). It all smells a bit ‘open air’, one gets little puffs of fragrance rather than a full-on gust. And the florals are handled with exceptional daintiness – there’s not a molecule of indole to be had for love or money. AdP call this a ‘floral chypre’ but the firm jawline expected from the latter descriptor is entirely missing, as is the iris of the perfume’s name. Stranger things happen in perfumery. Much as I admire how it smells for the most part, I find Iris Nobile just a touch too wispy (and this is the EDP I’m talking about). One could douse oneself in a few ml of this stuff and still be left wanting more. Plus it seems to fizzle out almost completely after a few hours – all that’s left is a smudgy base of some jasmine-like chemical and a touch of musk hanging close to the skin. Perhaps a more accurate name might have been "Gardenia Nobile." As we all know gardenia oil is scentless, so the "impression" of gardenia must be created by combinations of other oils. To my nose and on my skin I get this impression of gardenia, supported by a dry iris. I get none of the other notes in the scent tree. It is very very light, even with ample application and very feminine, best for spring and early summer wear. It is quite nice, but not distinguished enough for a thumbs up. Just pleasant and wearable. As well as mis-named. When I was at school, we read a short parable about two silver ladles – one was plain and unadorned, the other ornately molded. I forget the details, but I remember that the moral of the story was that although the plain silver ladle looked rather ordinary compared to the excesses of the more decorative one, it actually took a lot more skill to make the plain ladle, because there was nowhere for mistakes to hide. Lesson: true beauty lies in simplicity, and simplicity is the hardest thing to pull off. 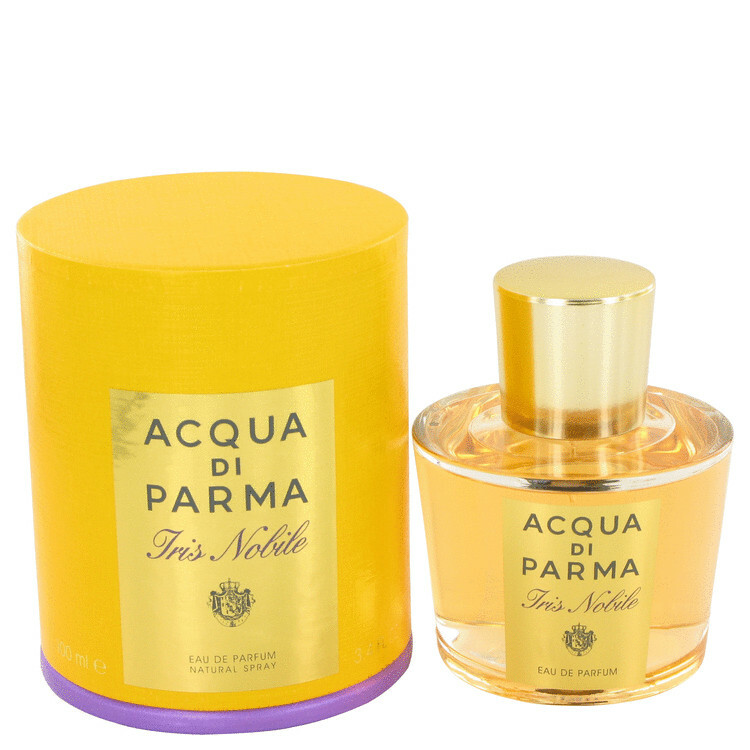 I am reminded of this parable when I wear Iris Nobile by Acqua di Parma. It is a perfume whose seams are so invisible to the naked eye that you might think it was just a plain old silver ladle at first. But look closely, and you see that the real skill here was in crafting a perfectly round object that moves quietly from one part of its transition to the next without alerting you to its movements. Its beauty lies in its apparent ease, like a beautiful swan gliding across a lake, whose frantically paddling legs are hidden under the water’s surface. The name is classic misdirection. After a brief but lovely burst of cool, crisp citrus and watery green iris flower, Iris Nobile unfurls into a massive, creamy white floral – mostly orange blossom. The effect is like steaming iris petals over a pan of simmering cream. It is rich but also delicate. I wore it a couple of times before looking up the name of the perfumer, and the minute I saw the name Francis Kurkdijan on the ticket, I had a classic “aha” moment. Kurkdijan, of course! For me, Kurkdijan has both a defining style and a signature set of notes beloved by him and used often in his compositions. He often uses orange blossoms, fresh citrus notes like orange, rose, honey, and musk in his fragrances – these are, and I’m generalizing grossly here, signature notes he comes back to time and time again. His defining style is a great delicacy and refinement in how he handles these often heavy, sweet notes, and most importantly, the tremendous skill with which he is able to use these notes as points of a triangle within which to innovate, stretch, and find new forms. Iris? Not so much. Noble? Absolutely. Sure, I suppose there’s some iris in here, but this is more of a sweet, spicy rose and fruit composition, and anyone expecting something like Hiris, Iris Silver Mist, or Iris Bleu Gris is going to be disappointed. On the other hand, if you disregard the label you’ll discover a beautiful, rich, indolic floral over a dense chypre base. I find it very hard to resist. Granted, part of my delight in this scent may lie in the utter surprise of its content, but I believe myself enough of a cynic that this couldn’t be entirely the case. Iris does become more prominent as Iris Nobile develops, but never takes center stage. Instead it provides a smooth, plush undercarriage for the spice, fruit, and floral notes. When these subside, they expose a powdery chypre foundation that smells like an extension of the skin itself. Iris Nobile is a tenacious scent that lasts for several hours, and it offers plenty of sillage and projection, so it will not go unnoticed. All in all, an unexpected pleasure. An opening that is fairly typical bergamot, orange and star anise, with lots of aldehydes. Ylang-ylang is prominent together with a sweetish vanilla in the drydown, and on my skin the iris is pretty much drowned out by the other notes. Overall not bad; it is dense, rich and intense, but a fairly formulaic scent following a trodden path. Decent silage and projection with three hours of longevity on me. There are no member images of Iris Nobile yet. Why not be the first?